Chicken soup – healthy soup recipe for babies, toddlers and kids made with chicken and little spices. 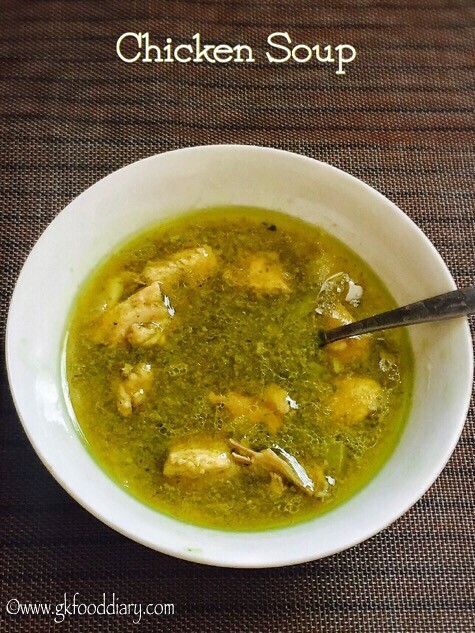 Chicken soup is a great remedy for cold and cough as it helps to reduce the stuffy nose and congestion, and also its apt for monsoon and winter season! 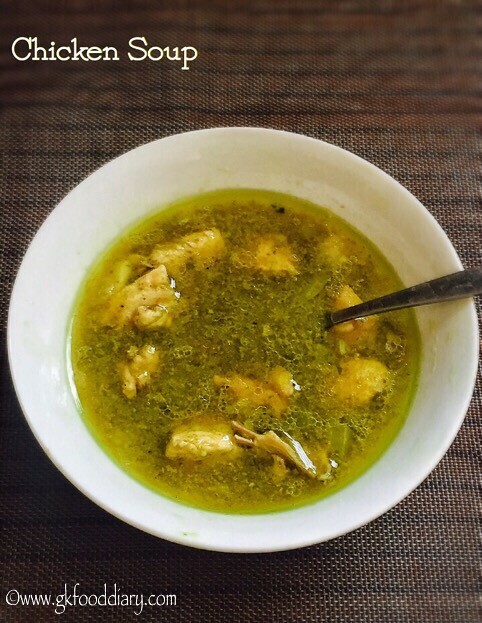 As chicken soup is made with onions, ginger and garlic, that helps to boosts the immune system as well. I make this chicken soup more often as its our family favorite. This chicken soup can be given to babies from 8 months as a clear soup. 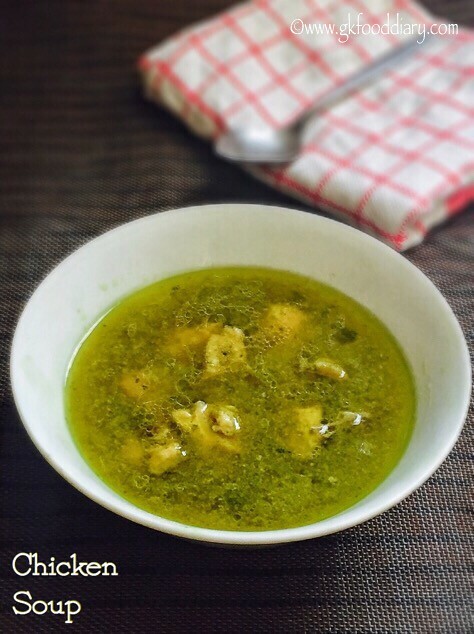 If your baby/kid doesn’t want to drink it plain, you could also serve this chicken soup with mashed rice, idli dosa etc.For more information on introducing and selecting chicken to babies , check here. Now Let’s check how to make chicken soup recipe for babies, toddlers and kids. 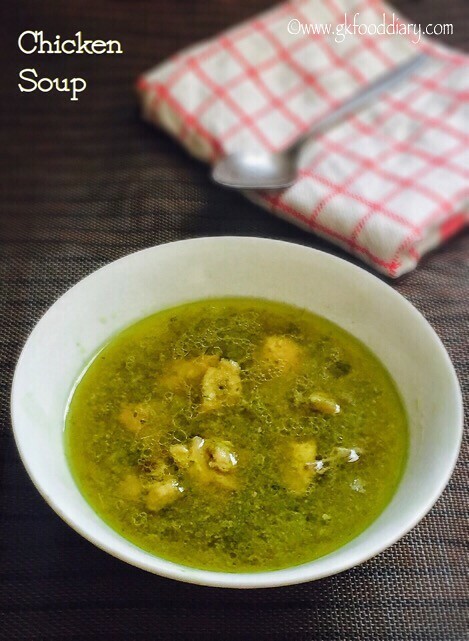 Chicken Soup - Easy and healthy soup for babies toddlers and kids with chicken. Keep all ingredients ready. Clean chicken pieces and chop into small pieces. 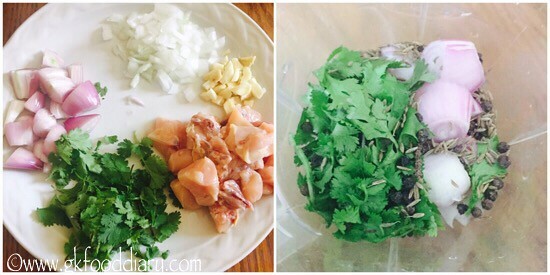 Finely chop ginger, coriander leaves, onions & garlic. 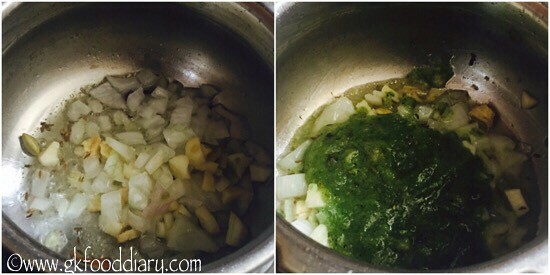 Grind half amount of onions, coriander leaves, cumin seeds and pepper corns to a fine paste. In a pressure cooker, heat a tsp of ghee/oil and add cinnamon, cloves & cumin seeds. Let cumin seeds crackle. Then add remaining onions, chopped ginger & garlic. Fry them nicely until golden brown. Now add ground coriander paste and saute until raw smell leaves. Then add turmeric powder, pepper powder(if using) and required salt. Mix everything well and then add chopped chicken pieces and saute it nicely for 5 minutes. Pressure cook the chicken with 2 cups of water for 3-4 whistles in medium flame or until the chicken is cooked well. Once the pressure is released open the cooker. Strain the chicken soup with a strainer to get a clear soup, if desired. 1. Keep all ingredients ready. Clean chicken pieces and chop into small pieces. 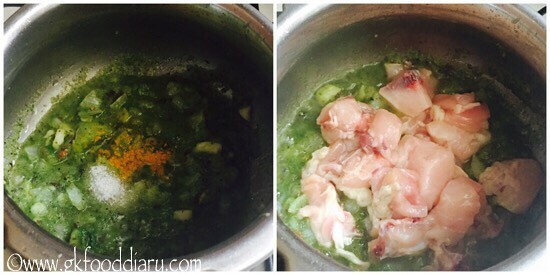 Finely chop ginger, coriander leaves, onions & garlic. Grind half amount of onions, coriander leaves, cumin seeds and pepper corns to a fine paste. 2. In a pressure cooker, heat a tsp of ghee/oil and add cinnamon, cloves & cumin seeds. Let cumin seeds crackle. 3. Then add remaining onions, chopped ginger & garlic. Fry them nicely until golden brown. Now add ground coriander paste and saute until raw smell leaves. 4. Then add turmeric powder, pepper powder(if using) and required salt. Mix everything well and then add chopped chicken pieces and saute it nicely for 5 minutes. 5. Pressure cook the chicken with 2 cups of water for 3-4 whistles in medium flame or until the chicken is cooked well. Once the pressure is released open the cooker. Strain the chicken soup with a strainer to get a clear soup, if desired. 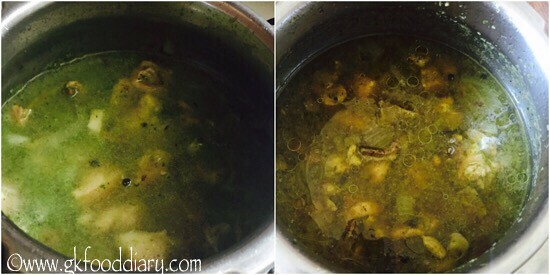 Healthy chicken soup is ready. Serve warm! 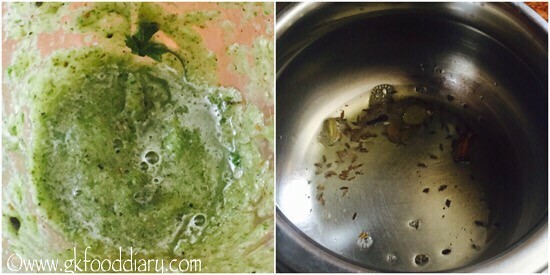 For small babies, offer as clear soup after straining the soup using a strainer. Chicken with bone pieces works well for this recipe. You could also add one small chopped carrot to this soup to make it more healthy. Add chopped carrots after adding coriander paste, if using. Make sure to clean the chicken pieces well. Add a tsp of red chilli powder if you prefer more spicy. 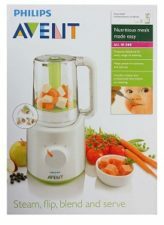 Is this soup advisable for babies under 1 year? Wont the garlic, cloves, pepper etc make the soup a bit spicy for babies? Thank you so much for sharing your feedback:) glad your baby likes it. I tried this today. Taste superbly good. My kids are enjoying it.